… more from the New York Chocolate Show 2012. You read about my experience in the show in my previous post. This post is about a short informative (and tasting) session that I attended on Culinary Trends in Chocolate during the NY Chocolate Show. The session was conducted by a representative of the National Confectioners Association. Inclusion of bananas in chocolate: A few years ago, the trend of adding fruits in chocolate started apparently with pomegranate. Pomegranate is valued for its contents of flavonoids which have beneficial effects on health, i.e., reduction in incidence of cardio-vascular disease. What started off as eating pomegranate, became a trend in drinking pomegranate juice, went on to adding pomegranate in salads and now its easy to find Trader Joe’s dark chocolate covered pomegranates (if you live near / can drive to a Trader Joe’s store) or Hershey’s Dark Chocolate with Pomegranate. Back to the banana now: Bananas have been used in smoothies for the longest time. Soon we might find a vegan banana chocolate spread (tasted yummy) to spread on your morning toast, or to include in your brownie mix. I have seen dried banana covered in chocolates available in some grocery stores. I prefer a fresh banana to a dried one, but it was not too bad. A small piece of milk chocolate peanut butter banana bar tasted awesome!! Apparently, it won an innovation award and I missed noting down which one it was. Seasonings: Expect more seasonings in chocolate – common one we are used to and exotic ones (from an Asian kitchen). We might have seen sea salt on top of chocolate bars and desserts here in NYC. What goes best with salt? Yes, its Pepper, and it goes well with chocolate too. 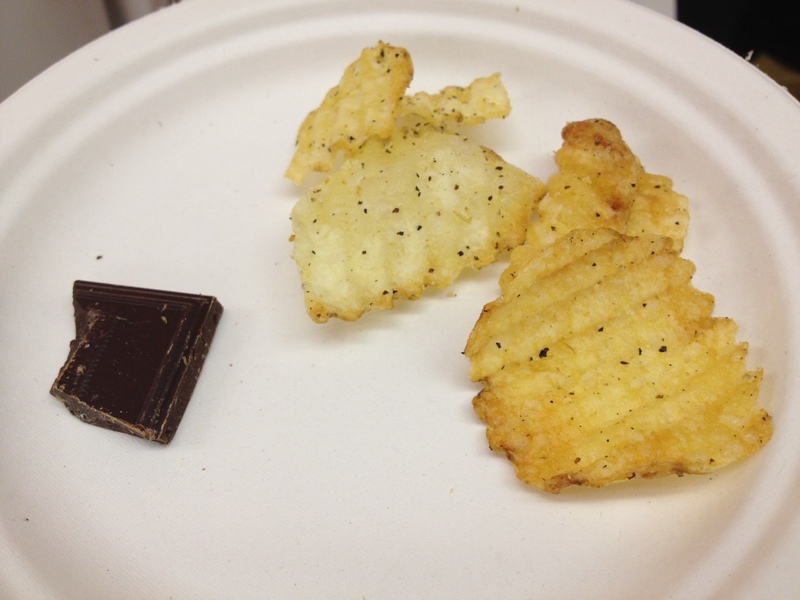 I tried a piece of a salt and pepper chocolate bar, where the pepper was intense. I thought it took away something from my chocolate experience. Had the pepper been less pronounced, I might have enjoyed it more. What are some of the ingredients you might find in an Asian kitchen? Ginger, curry powder, and wasabi? I tried all these with chocolate and I must say that it was quite an experience! Candied ginger is sweet and ginger-y and I like it. Ginger covered chocolate was quite nice too. Sweet curry dark chocolate was not something that I liked. It was supposed to include 14 different ingredients as part of the curry flavor. There was too much curry flavor for me to enjoy with the dark chocolate. Ginger wasabi dark chocolate was my absolute favorite!! Am not sure if this is commercially available. The piece of chocolate tasted of ginger to begin with, but it was not an intense taste of ginger. 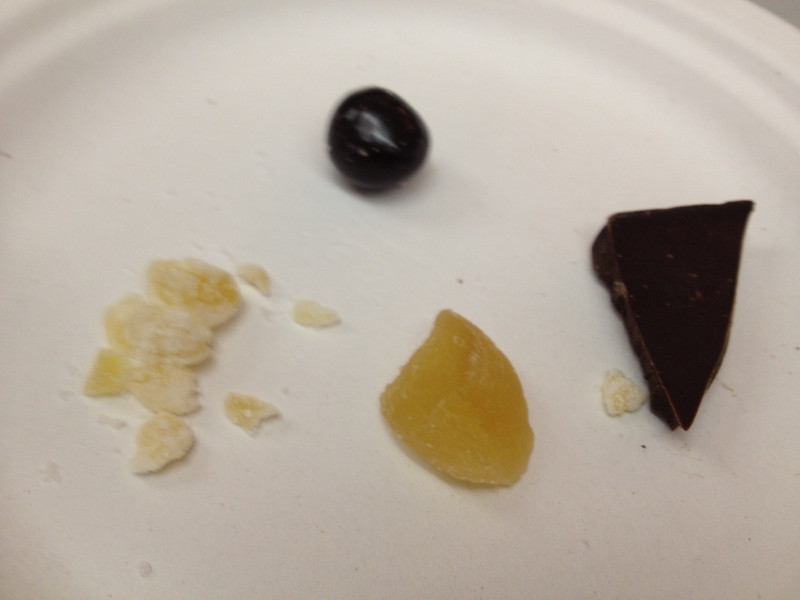 Towards the last bite, I could feel the mild kick of the wasabi, and was glad to taste something else that was sweeter, but yet wanted more of the ginger wasabi dark chocolate…. More products from the cocoa pod: You might know that the chocolate we eat is from the dried and fermented seeds of the cocoa pod. There is pulp surrounding the seeds, and the pulp is almost never eaten with chocolate. At the tasting session I got to taste some products made with the pulp that are not commercially available, but I wish they were. Chocolate pulp marmalade: This marmalade came frozen from a farmer in Ecuador (not sure which farm), and was specially imported by the National Confectioners Association. 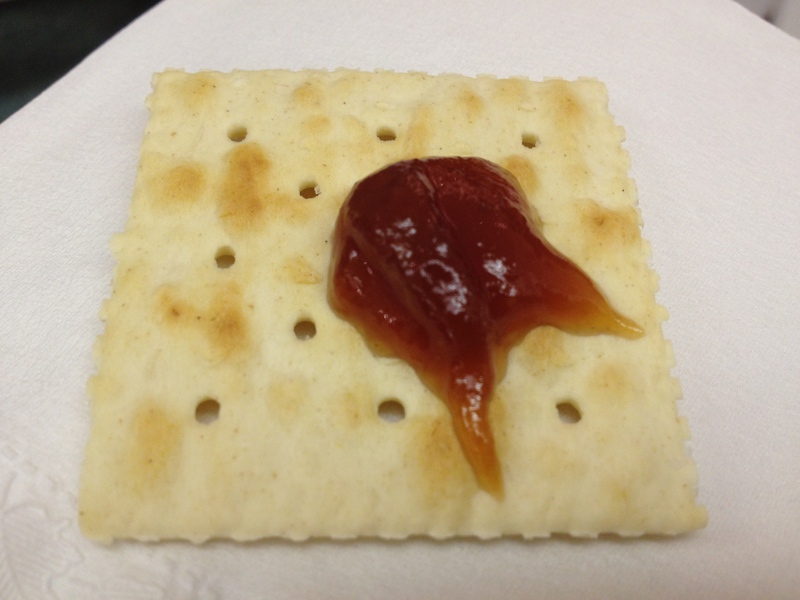 The marmalade was mild, yet very tasty when spread on a cracker. It had a faint smell of chocolate and of a tropical fruit. How I wish this was commercially available here in the US. Cocoa pulp drink: This drink too came from the same farmer from Ecuador who made the marmalade. It had the marmalade, milk, and some pulp. 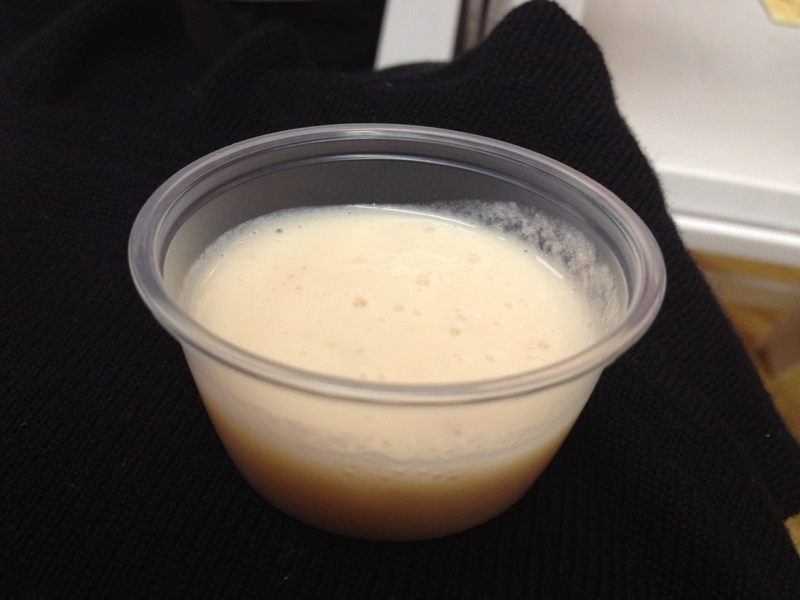 I thought the drink was underwhelming – it was neither sweet nor much different from milk. 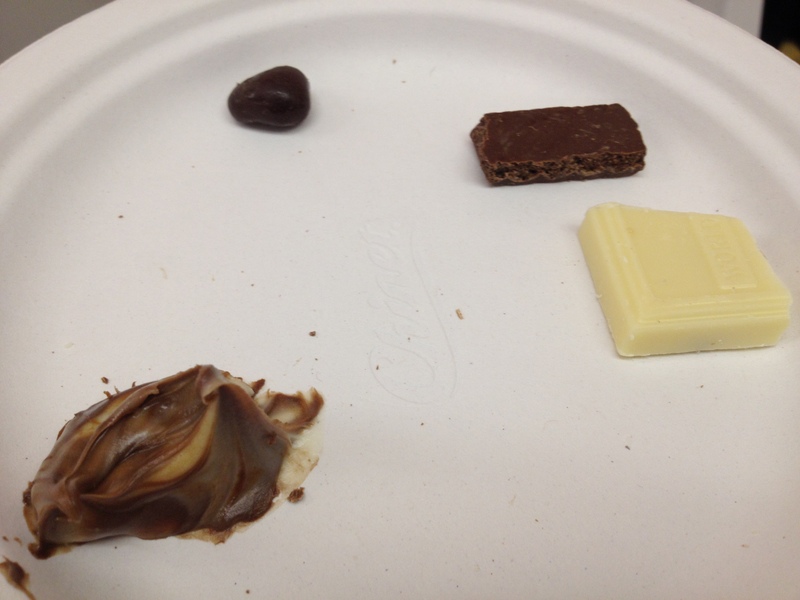 In my previous post, you read about my musings on the lack of a palate cleaner for tasting chocolates at the NY Chocolate Show 2012. According to this page, the best palate cleanser for chocolate is either a bland unsalted cracker, or a slice of green apple and a sip of plain water or seltzer. Note to self: Take some of these on the next chocolate tasting event. If you find any of the products above or a new flavor or fruit with chocolate in any of the Holiday Markets in NYC or where you live, please let me know. I would love to try them…. Did I mention that I overdosed on chocolate at the NY Chocolate show? But its now over a week, so, time for more chocolate in my system……Meanwhile, enjoy your Thanksgiving with friends and family! !